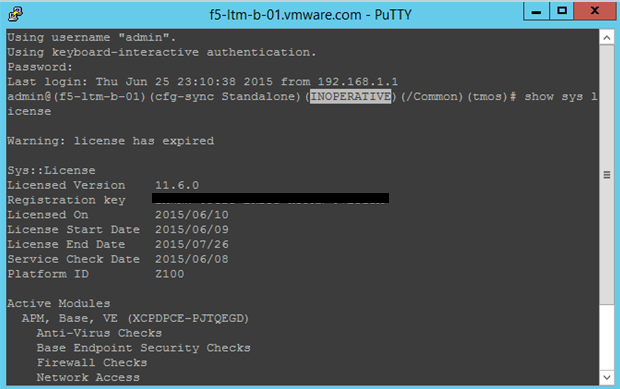 In this article we will see how we can reactivate a F5 BIG-IP VE (Virtual Edition) Appliance that has an expired license. When the license is expired the BIG-IP Configuration utility gets stuck in “Configuration Utility restarting…” and you cannot login. We will focus on one of the latest VE versions 11.6.x where most of the usual methods to reactivate will not work. Recently I had an issue where my BIG-IP Local Traffic Manager (LTM) and Global Traffic Manager (GTM) devices had an expired license. I was using a 45 days license which I failed to reactivate it got expired. 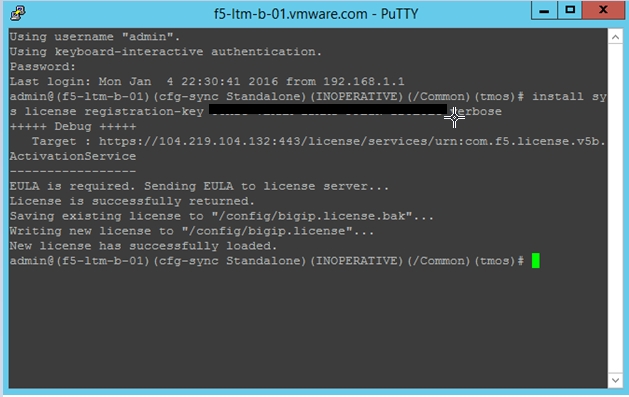 I first noticed that there was an issue with the appliance when I tried to open the BIG-IP Configuration utility. As shown in the following screenshot it got stuck in “Configuration Utility restarting…” and I wasn’t able to login. Luckily I had a user with SSH access to the F5 BIG-IP VE appliance. If you don’t have SSH access to the appliance you are in big trouble. In such cases I wasn’t able to find a solution and had to reinstall the BIG-IP device and redo all the configurations. As said I was lucky enough to have SSH access to I logged to the appliance and check the license by running [show sys license] . As you can see from the following screenshot the license was expired. You will also notice other signs that there is something wrong like the work INOPERATIVE. 01070356:3: Load balancing feature not licensed. Generally you can find a lot of F5 articles and forum posts describing how to install a license again and activate the device. Unfortunately the BIG-IP VE appliance has not bash shell access, therefore you cannot execute any of these commands. In the BIG-IP Virtual Edition Appliance you only have access to the Traffic Management Shell (tmsh) utility. the BASH shell is disabled. Even if you try to grant bash access to your user, the command will run successfully, but you will not be granted access. This again doesn’t work because the license has already expired so the load cannot complete and fails. You might find further articles that describe the use of the [install sys license registration-key] command to activate the BIG-IP. Use the [get-dossier –b <product_key>] to generate a dossier. Go to the https://activate.f5.com/license/dossier.jsp website and generate a license file. Run the [install sys license registration-key] command to activate the device. Alternatively if you do not have direct access to internet from the appliance you can use the [csp] command from second linux appliance to copy the license file to the F5 BIG-IP device. Go to the Go to the https://activate.f5.com/license/dossier.jsp website and paste the dossier. Accept the license agreement and generete the license file. LIke we mentioned if your F5 device has internet connection you do no need to download the license. New license has successfully loaded. After running the command I had to reboot the appliance. Alternatively if your device does not have access to internet you can download the license after you have accepted the EULA agreement. Copy it to a linux appliance of your choice. From that linux appliance use command similar to the following to copy the license into the /config/ folder on the F5 BIG-IP device. This entry was posted in F5, Licensing and tagged Configuration Utility restarting, F5 BIG-IP, GTM, license expired, LTM, reactivate, SKKB1023, VE. Bookmark the permalink.